Data Recovery Software needed for your hard drive, usb flash, memory card? Try iCare Data Recovery Pro, the professional deep scan recovery built-in software is able to recover data after delete, format, raw format, virus attack, unrecognized drive and other versatile cases when your data on your drive became inaccessible due to human mistakes or other unknow errors. Logical data losses can always be rescued when the drive where you saved your data is not in physical damage. 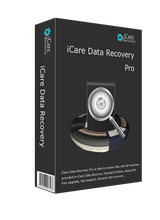 iCare Data Recovery Pro is equiped with outstanding performance in raw file recovery which recovers every possible file, even the pretty old files when there were not overwritten.